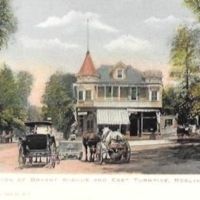 Junction of Bryant Avenue and East Turnpike, Roslyn, L.I. View of the junction of Bryant Avenue and East Turnpike (now Old Northern Boulevard). At center, there is a two-story Victorian style building. There are also several horse drawn carriages parked along the intersection. Illustrated Post Card Co., N.Y. 35--4. 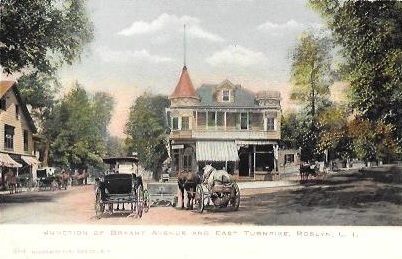 Illustrated Post Card Co., N.Y. 35--4. , “Junction of Bryant Avenue and East Turnpike, Roslyn, L.I.,” Hofstra University Library Special Collections: Digital Collections, accessed April 19, 2019, https://omeka.hofstra.edu/items/show/2832.